Last month, I lamented about how a Mercedes-Maybach just wasn’t good enough for the idea it was supposed to bear. An insulting second-place prize for what indisputably should have been first. But I now know what first place looks like: The Mercedes-Maybach Pullman. 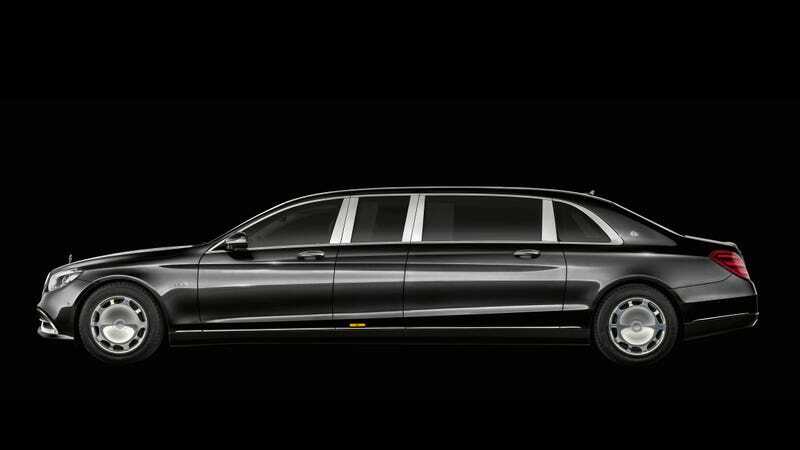 The Pullman is the long wheelbase version of the already long wheelbase version of the Mercedes-Benz S-Class. It now has a new grille that’s “inspired by a pinstriped suit” (‘30s gangster style is in?) and the twin-turbo V12 engine makes 630 horsepower—one for each zero at the end of your salary. The new Pullman also has a front-view camera. Fancy people sitting in the back seat will be able to see the IRL traffic in front of the car even when the partition is closed. This, I imagine, is good for surveying the surroundings when you’re sitting all cocooned in the back of your Pullman, conducting secret business. Currently, no U.S. pricing was announced in the Pullman’s press release, but it does say that it costs “around half a million Euro.” That’s the kind of vague figure that I like to see associated with a car’s price! Anyway, check out the inside. Does it still look just like an S-Class? You bet. But there is so much extra car there that it kind of makes up for the design. That extra car amounts to more seats and additional luxury materials inside, like surfaces finished with wood found only in the land of Oz. What human rear end, politician, royalty or otherwise, is fitting for such a vehicle? None. There are none. Any guesses as to how many cows gave their lives for this thing?